Which one is built for your wrist? Samsung just unveiled its brand new smartwatch - the Galaxy Watch - alongside the Galaxy Note 9, but how does it compare to our favorite smartwatch right now? The Apple Watch 3 is almost a year old now, but it's still one of our favorite devices for your wrist. If you're wondering about plumping for the new smartwatch from Samsung or the latest Apple Watch, you're in the right place. Below we're going to break down the specs, design, price and more that we know about both watches so far. Let's kick off with the design of the new Samsung Galaxy Watch. There are two different versions for you to choose from, with 46mm and 42mm options on offer. Each has a rotating bezel for you to interact with the watch, which is something the Apple Watch doesn't offer. It's worth noting the Galaxy Watch is round too, unlike the Apple Watch 3 with its square design. The larger of the two watches only comes in silver, while the 42mm comes in rose gold and black. You have a selection of different straps for each model, which you can read all about here. The Apple Watch 3 comes in two sizes too, but the first version is smaller than the Galaxy Watch. You have the choice of 38mm or 42mm, which may suit those looking for a sleeker device. With the Apple Watch you've got the choice of different materials including aluminum, stainless steel and ceramic, plus you've got a huge choice of colors to wade through before you can find your perfect watch. The display on the larger Samsung Galaxy Watch is a 1.3-inch AMOLED, while the smaller has a 1.2-inch screen. Both have a resolution of 360 x 360, which should look pretty sharp on your wrist. The 1.65-inch display on the larger Apple Watch 3 has always felt like the most comfortable and easy to read size, while the display on the 38mm one is a little bit smaller to account for that slightly more compact design. The Apple Watch does have that slightly larger display, but both watches offer enough room to interact with the apps you want to play around with as well as reading your notifications. Samsung's fitness features are all here with tracking for lots of different sports including yoga, cycling and much more. There's a wrist-based heart rate monitor, GPS built-in and it's designed to go in the pool to track your swimming too, with 5 ATM water resistance. New features include a stress management tool that tracks your heart rate and gives you reminders to breath when your stress level is higher than expected, plus it's now better at automatically tracking workouts when you start them too - able to recognize six different activities. This is a similar level of spec to what you can do with the Apple Watch 3, although that device doesn't have that stress monitoring feature. You'll be able to use the Samsung Galaxy Watch with both iPhone and Android devices, while the Apple Watch only works with iPhones. That's something that may make your mind up for you if you're an Android phone user. The Galaxy Watch comes running the latest version of Tizen software, while the Apple Watch 3 has the slightly more accomplished watchOS 4 software on board. Tizen is improving with time with lots of app developers contributing to the platform, but at this time watchOS is a touch more useful and includes more apps. Inside the Apple Watch 3 is the latest Apple S3 chipset, while the Galaxy Watch is powered by the Exynos 9110 dual-core 1.15GHz chipset. The Watch 3 and the 42mm Galaxy Watch have 768MB of RAM, but the 46mm Samsung device comes with a whole 1.5GB. We've yet to use the Exynos in a smartwatch, so we don't currently know how powerful it will be but we'd obviously expect the version with more RAM to be a touch speedier. For battery, the Apple Watch 3 has a 279mAh cell that we find lasts around a day on average. The larger Samsung Galaxy Watch has a 472mAh cell inside, which is huge for a smartwatch. Samsung believes this can last seven days from a single charge. If that's true, that'll be a gamechanger in the smartwatch space as many fully-fledged devices like this only last a day or two from one charge. The smaller Galaxy Watch only has a 270mAh cell, so it's more likely to last around two days or so. We don't currently have any pricing details for the Samsung Galaxy Watch. The larger LTE version of the watch is sure to cost more than the Bluetooth only variant, but we don't currently know what that price difference will be. As for the Apple Watch 3, the price starts at £329 / $329 / AU$459 but if you want the LTE version of the watch you'll have to spend a bit extra at £399 / $399 / AU$559. It's also worth noting that price will likely drop soon if the company announces the Apple Watch 4 in September, as it's possible it might do. 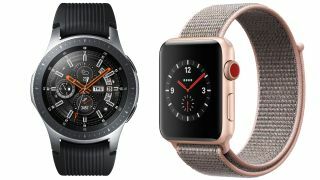 Which one of these watches you buy may ultimately come down to the price and the type of phone you own, but the Samsung Galaxy Watch looks like it could be a suitable alternative to the Apple Watch 3. Bear in mind though, the Apple Watch 4 may be just around the corner and could offer some brand new features neither of these watches have. We won't know until our full review, but the Samsung Galaxy Watch looks to have all the top-end features you'd want and may even have phenomenal battery life as well. We're skeptical the Galaxy Watch will be able to run for seven days in full smartwatch mode, but if it can we'll be very impressed and it may topple the Apple Watch 3 as our favorite device - as long as it packs some other genuine improvements.